Chi Omega Sorority Sisters Sweep for a Sweet 3-Peat! When the Chicago Bulls and Los Angeles Lakers won NBA championships three years in a row, they were considered a dynasty and the term 3-Peat came into light. Now, there is another 3-Peat that has occurred. It consists of the sisters of Chi Omega Sorority at the University of Pittsburgh. When it comes to Homecoming Queen Elections whether their sorority is a dynasty is up to you to decide! Every year full-time students run for Homecoming King and Queen Elections hoping the student body will crown them the next King and Queen. Homecoming 2005 was no different. The difference however has been in the support the Homecoming Queen candidate from Chi Omega Sorority has received in the past three years. These past three years, their Chi Omega sisters have found creative ways of campaigning for their sister candidates running for Homecoming Queen. These past three years their sister candidates have been elected to be part of the Homecoming Court of Five. No matter how early the gates open for the Homecoming Game, the pledges and sisters of Chi Omega have found ways to occupy the front few rows of the students' section to show support for their Homecoming Queen candidates. Each of these past three years, a sister from Chi Omega has been crowned Homecoming Queen! 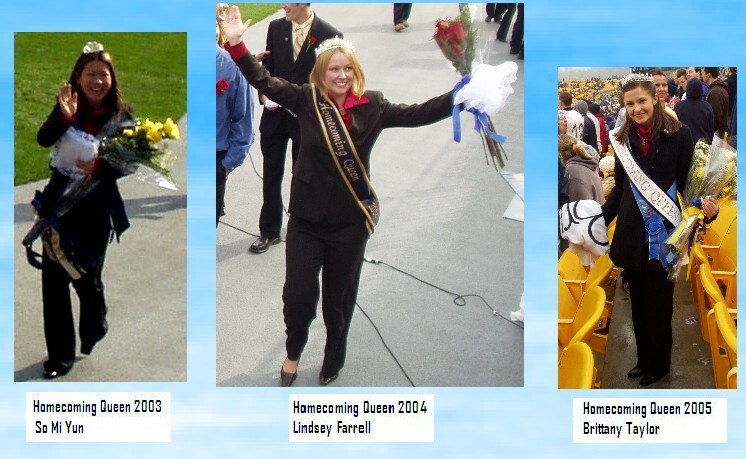 When repeats are hard to achieve, Chi Omega sisters have found ways to receive the support of the student body in crowning their sister the Homecoming Queen for 2003, 2004, 2005. It is especially a tribute to their accomplishments when the chemistry of the sorority changes each year with new pledges coming in and senior Chi O’s graduating. No one knows what 2006 will hold but Chi O’s can be proud of having one of their sisters become Homecoming Queen each of the past 3 years.